"Stick Man" - a collection of 3D graphics and interactive pieces exploring what happens when you give a well known 2D symbol depth and a 3D world to inhabit. An installation work, "Sea" from this series was exhibited at Galapagos Art Space, Brooklyn, NY November 13th - 15th 2003. Musical Flocking Box - Exhibited at the 2003 ITP Spring Show, developed in collaboration with Daniel Shiffman. Musical Orbit Box and other coursework for the Spring 2003 Dynamic Bodies course at ITP. 3D Sound Sculpture - Developed in collaboration with Przemyslaw Moskal. Finalist at the Villette-Numerique Net Art competition. Exhibited at the 2002 ITP Spring Show, the digiart gallery at the Cite des Sciences et de l'Industrie and the Net Art gallery at the Grande Halle de la Villette during the Villette Numerique festival in Paris Fall 2002 as well as the Europa Club Digital Art exhibition in Brooklyn, NY March 29th 2003. Mentions in the French and Polish press. "3D Sound Sculpture" is being featured on the website for the Norapolis 2004 International Multimedia Design Conference in the "Zone K" section ("Build Your Own Universe") as "Zone K 002." The World in 3D: "Pixel" by "Pixel" - Exhibited at the 2002 ITP Fall Show and the Europa Club Digital Art exhibition in Brooklyn, NY March 29th 2003. 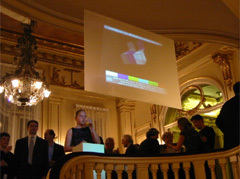 Physical Installation Piece for the 2002 Chopin Festival - developed in collaboration with Przemyslaw Moskal, Andres Jimenez, Sherri Wasserman, and Jimmy Chung. Exhibited November 16th 2002, at the Polish and Slavic Center in Greenpoint, Brooklyn, NY. 3D Music World - exhibited at the digiart gallery at the Villette Numerique festival at the Cite des Sciences et de l'Industrie in Paris Fall 2002. Shockwave 3D Musical Instrument - Exhibited at the 2002 ITP Spring Show. NBA.com - client work: post production recordist, editor, and mixer for a flash movie for nba.com - 2001. Paper: Global Communication Systems in Online Worlds. - Final Paper for the Spring 2002 Anthropology of Online Games class at ITP.